A hawker food commonly found in Singapore. It is usually sold together with those stalls that sell fried carrot cake. No more going to hawker centres. 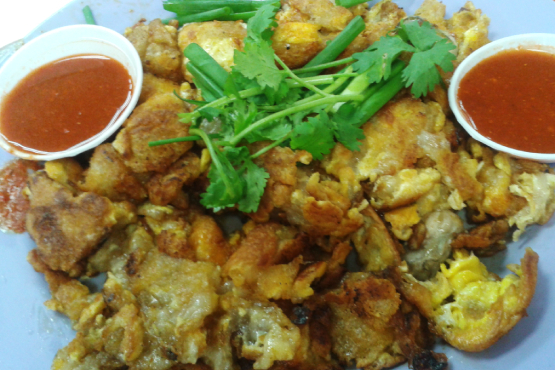 You can now savour the lip smacking fried oyster omelette at the convenience of your home! Heat frying pan and add in 2 tbsp lard. Add in ½ portions of the batter and fry. Add in more oil, pour in ½ portion eggs and spread out. Fry till golden brown. Add in fresh oyster (coat with a little batter 1st), fish sauce and pepper. Sprinkle parsley and spring onions. Serve hot with Chilli Sauce and lime. Mix all ingredients in a small pot and boil for 5mins.